Multicoloured moving LED lights reflected and refracted in a crystal ball. A process known as light painting. It involves long exposures and moving brightly coloured LED lights. This is one of my favourites in this album. Has a sense of motion. 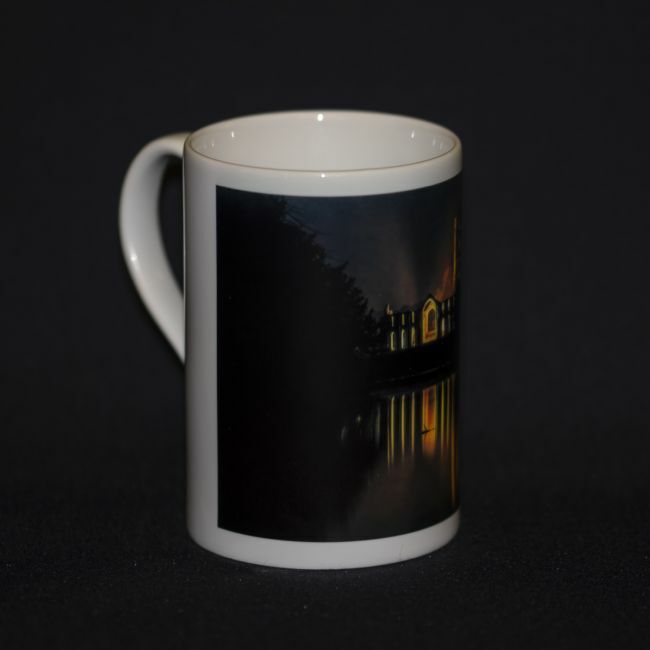 Picture is available on canvas, photo print, mouse mats and a selection of mugs. Reflections of tress and sun of the surface of a village pond. 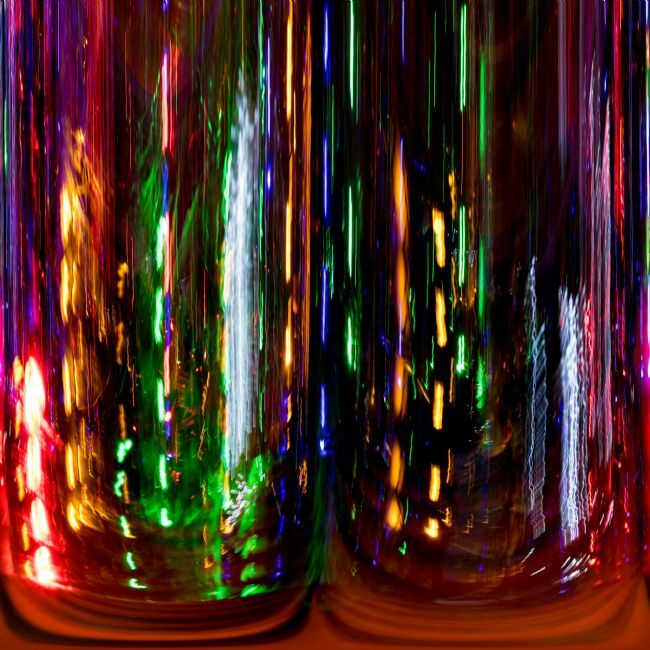 Moving LED muticoloured lights captured in a long abstract exposure. Bootham bar in York in sepia. The City of York Bootham Bar was built in the 14th and 19th centuries, it has some of the oldest surviving stonework, dating to the 11th century. One on the ancient gateways into the City. This image has a sepia tint. St Helen's Church, Stonegate, York in Sepia. St Helen's Church, Stonegate, York. One of the many churches in the ancient city. dates from the 14th century. It was declared redundant in 1551 and partially demolished, but survived and was later brought back into use. This image is with added sepia tone. York Minster West in Sepia. The distinctive heart shape tracery atop The Great West Window of York minster can be seen in this picture between the mighty bell towers. A sepia toned picture. Part of the famous roman walls around the city of York in North Yorkshire.They are known variously as York City Walls, the Bar Walls and the Roman walls. In the distance is Micklegate Bar, one of the four old gated entrances into the city. This picture has a sepia tint. Multicoloured moving LED lights reflected and refracted in a crystal ball. A process know as light painting. Moving multicoloured LED lights reflected in a glass crystal ball. A method known as light painting. With added Photoshop Fresco and invert effect. This Hunter represents XL571, the leading aircraft in the record breaking Blue Diamonds formation team of the RAF between 1961 and 1964. This team still holds the record for the largest number of aircraft lopped together. A hunter also held the worls speed record for awhile with a speed of 727.6 mph, piloted by Neville Duke. Black and white version. 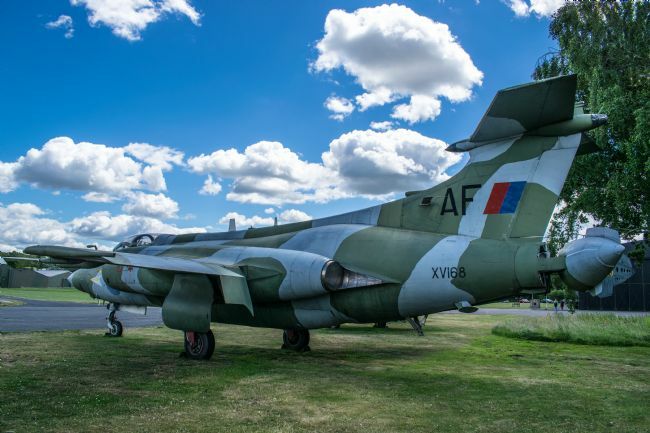 This Blackburn Buccaneer aircraft first flew from Holme on Spalding moor in 1966. It was first issued to the Royal Navy at Lossiemouth. It had a busy career before being transferred to the Royal Air Force at RAF Honington. After a long service it now resides as the Yorkshire Air Museum. Abstract picture of moving LED lights with a slow shutter speed. Abstarct picture of moving LED lights captured with a slow shtter speed. Dahlia pom pom flower Coasters abstract. A abstract picture produced by moving coloured LED lights and a slow shutter speed. A close up of an English country garden red rose. This is the city of York in the county of North Yorkshire showing some of the various old buildings and roof in the city. With added sepia tone. 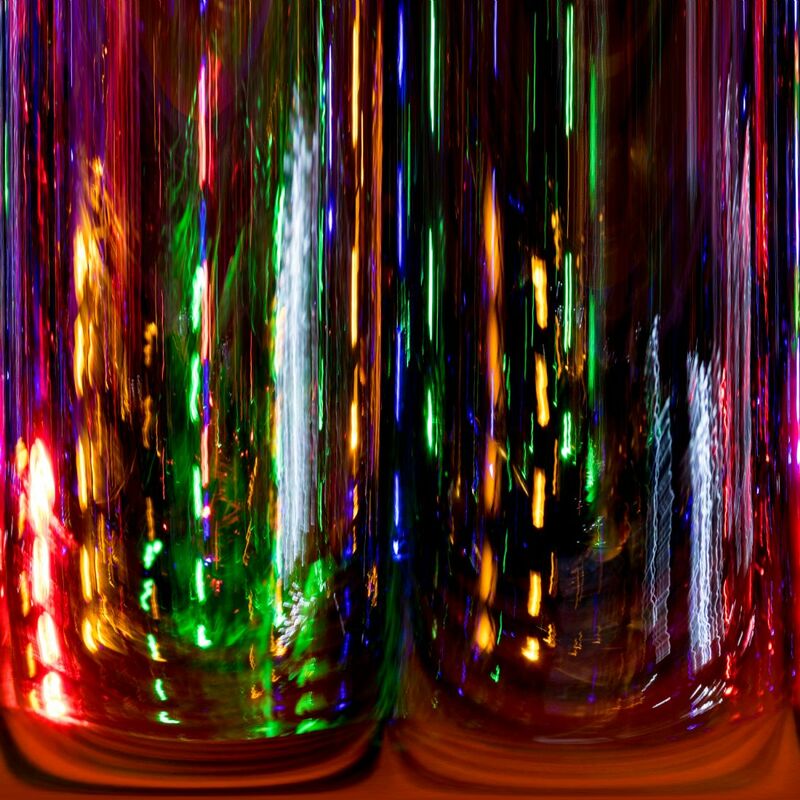 A brightly coloured abstract picture with streaks of coloured light. An abstract picture featuring multicoloured arches. A single pink and yellow dahlia flower in full bloom. Moving multicoloured LED lights reflected in a glass crystal ball. A method known as light painting. This is a M4 high speed artillery tractor. 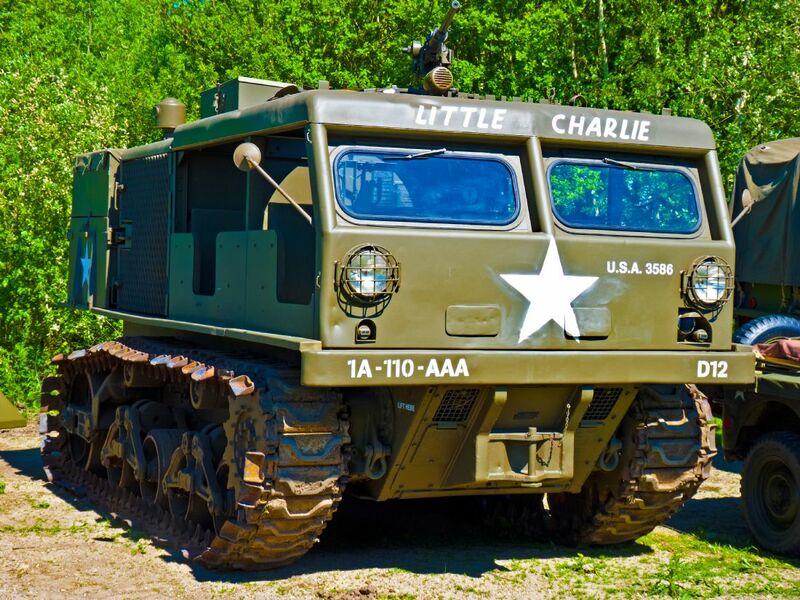 A military vehicle which saw service between 1943 right up to 1960. Stripped of service equipment after the war they saw service with logging companies, power line installations, road construction and many other rugged requirements. It has a 210HP engine with a top speed of 35 MPH. A crew of one plus 11 on board. Weight of 14.2 tons. The Wall in York city. Since Roman times York City in the county of Yorkshire has been protected by stone walls. York has more roman walls then any other city in England. They are known variously as York City Walls, the Bar Walls and the Roman walls. 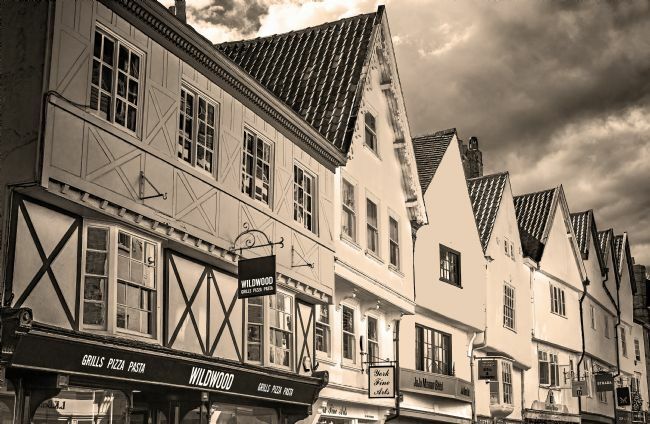 Part of the the old Shambles street in the City of York with it’s timber framed buildings.The name Shambles comes from the Saxon Fleshammels, which means, the street of the butchers, for it was here that the cities butchers market was located. Notice the wide window sills of the houses; the meat for sale was displayed here. Now one the Yorkshires favourites tourist attractions. 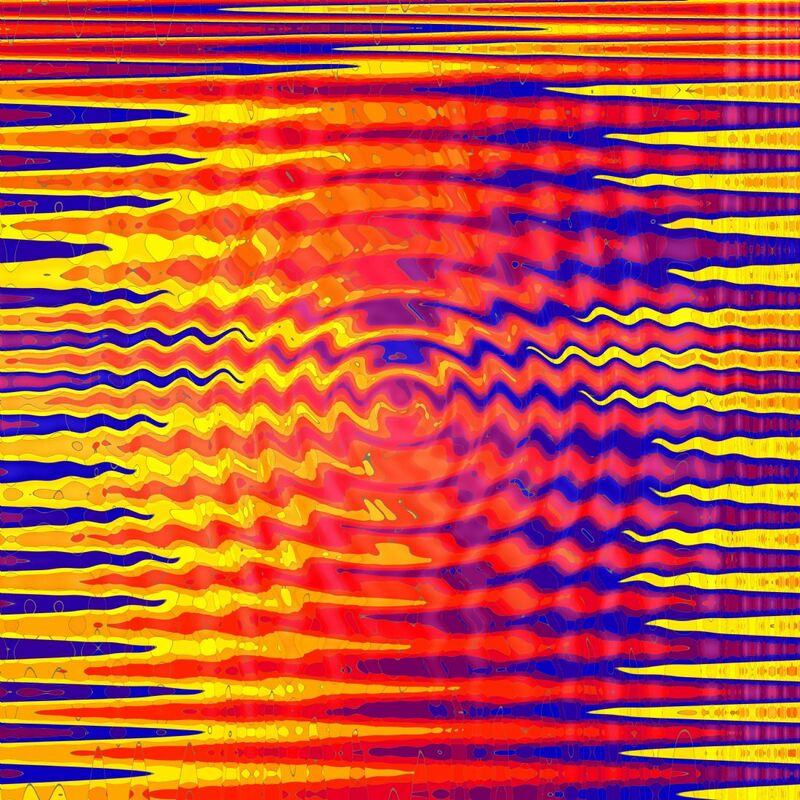 A square abstract, brighly coloured picture with reds, orange, yellow and a hint of blue streaks. An abstract picture tiltled Power Cell. Many digital actions where carried out to achieve this image. An abstract picture of colourful window blinds with light, shade and varying tones. A view from the City of York Roman walls across the city to the sun lit Minster. Part of the famous roman walls around the city of York can be seen on the left. 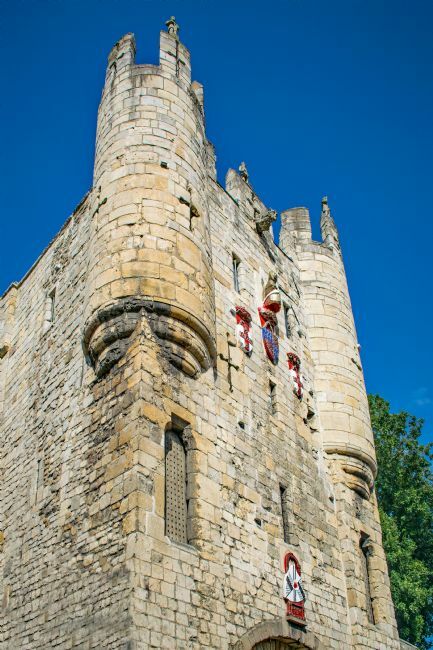 They are known variously as York City Walls, the Bar Walls and the Roman walls. In the distance is Micklegate Bar, one of the four old gated entrances into the city. A lot of the wall is open to the public. A good stroll can be had with views across the city centre on the way round. It has an estimated walk time of about 1 hour with a climb distance of 20 metres. A cityscape view of the mighty York Minster with some soap bubbles near the towers. 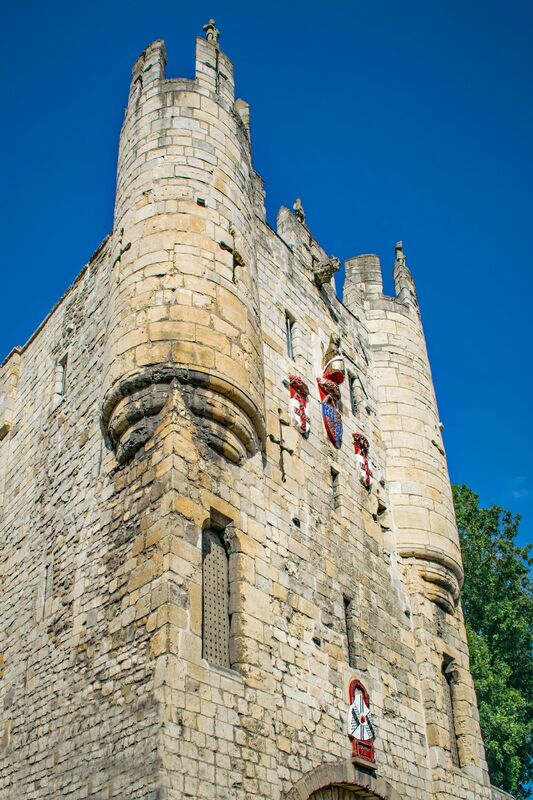 Miklegate bar in the city of York in the county of Nortth Yorkshire. The most imported of the four medieval gateways into the city. At least half a dozen reigning monarchs have passed through this gate and by tradition they stop here to ask the Lord Mayor's permission to enter the city. For centuries the severed heads of rebels and traitors were displayed above the gate, the many victims include Richard, Duke of York in 1460. A German WWII army mortorcycle with attached side car and machine gun. 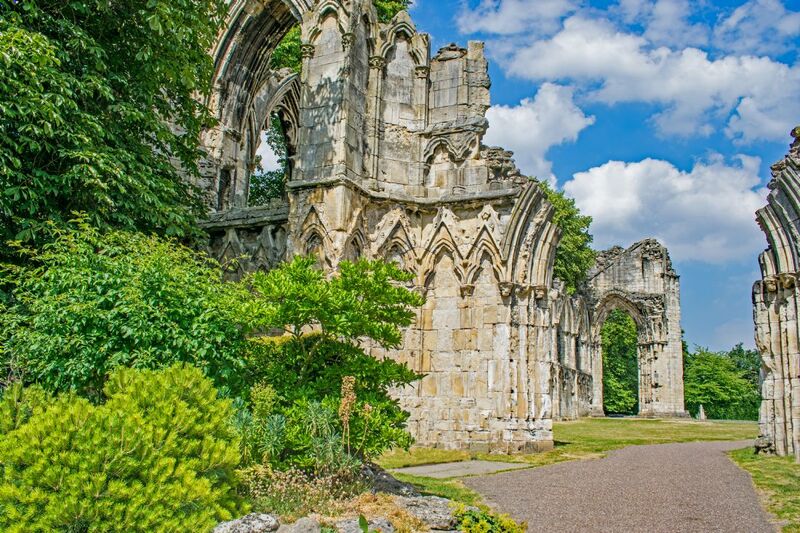 Part of the ruins of St Marys Abbey, can be found in the Museum gardens in York Yorkshire. First built in 1088, are all that remains of one of the wealthiest and most powerful Benedictine monasteries in England. The Grand Hotel in the city of York North Yorkshire. Built in 1906 as a ‘Palace of Business’ for the North Eastern Railway Company it is now a five star contemporary hotel. On the right of the picture is the North Eastern Railway War Memorial which is the First World War memorial in York in northern England. 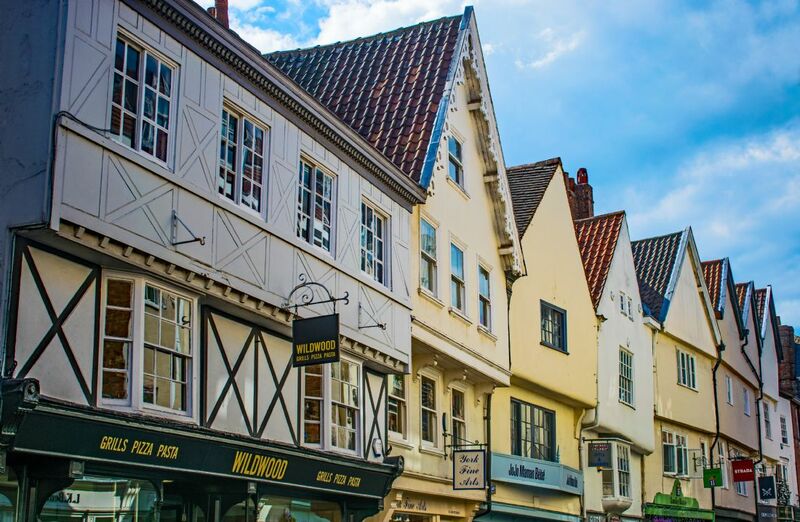 This is the city of York in the county of North Yorkshire showing some of the various old buildings and roof in the city. In the centre of the picture the round tower was used to secure a chain passed across the river from Lendal tower in the mid distance. This was to stop invaders and collect tolls from ships entering the city. Lendal bridge on the right and in the far distance a glimpse of the wonderful York Minster. St Wifrids church on the left with the mighty York Minster in the background. St Helen's Church, Stonegate, York. One of the many churches in the ancient city. dates from the 14th century. It was declared redundant in 1551 and partially demolished, but survived and was later brought back into use. Part of the the old Shambles street in the City of York with it’s timber framed buildings. The name Shambles comes from the Saxon Fleshammels, which means, the street of the butchers, for it was here that the cities butchers market was located. It had and still has very wide window sills on the houses at street level; the meat for sale was displayed here. Now one of the countries favourites tourist attractions. A single pink rose blossom flower. 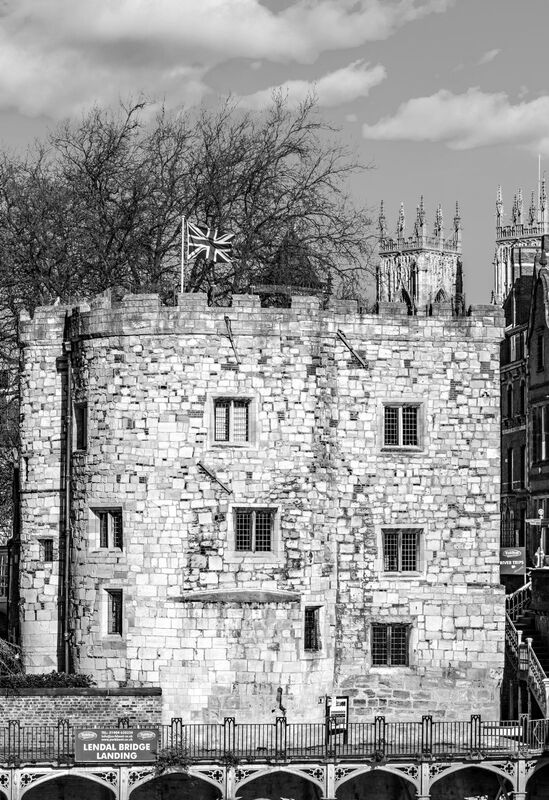 This is Lendal Tower in the city of York. 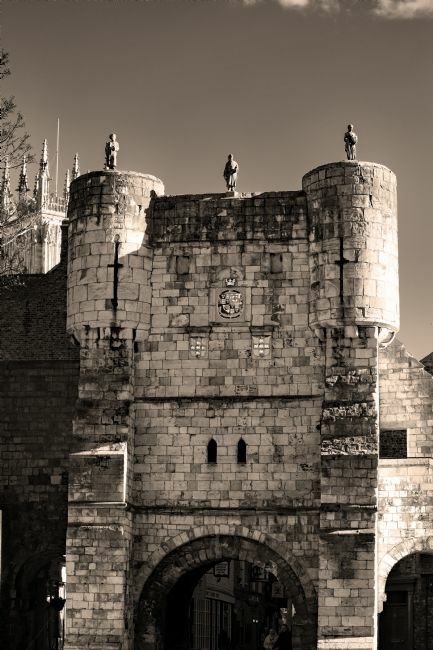 Build around 1300 its first use was to protect the City with a large iron chain stored in the tower which was pulled across the river to prevent invaders and unwanted visitors. 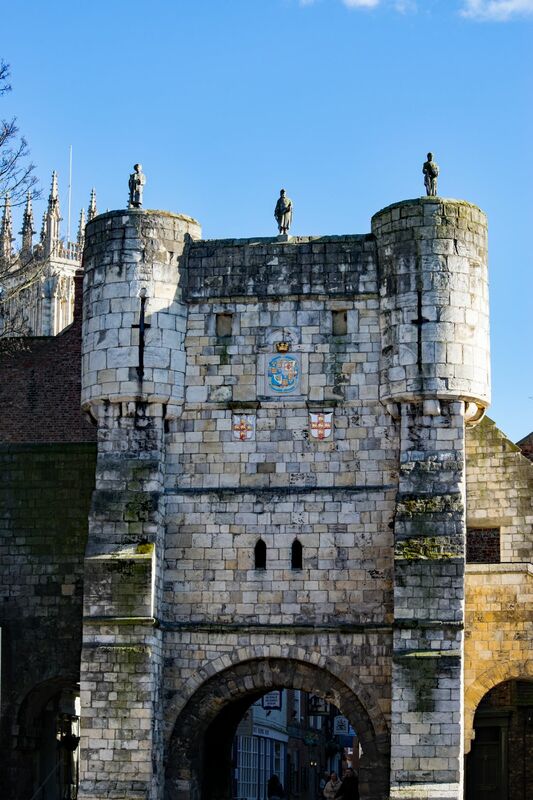 It was 1677 when the tower was leased for 500 years to the York waterworks company. Water was pumped from the tower into pipes that ran throughout York. This role continued for 200 years, until in 1836 a dedicated engine house was built. A hint of the mighty York minster can be seen in the background. Bootham Bar in the City of York. The City of York Bootham Bar was built in the 14th and 19th centuries, it has some of the oldest surviving stonework, dating to the 11th century. One on the ancient gateways into the City. Part of the ruins of St Marys Abbey,can be found in the Museum gardens in York Yorkshire. First built in 1088, are all that remains of one of the wealthiest and most powerful Benedictine monasteries in England. Part of the river Foss as it runs through the City of York in the county of North Yorkshire England. A view from Lendal bridge across the river Ouse. Guildhal on the left and Ouse bridge in the distance. 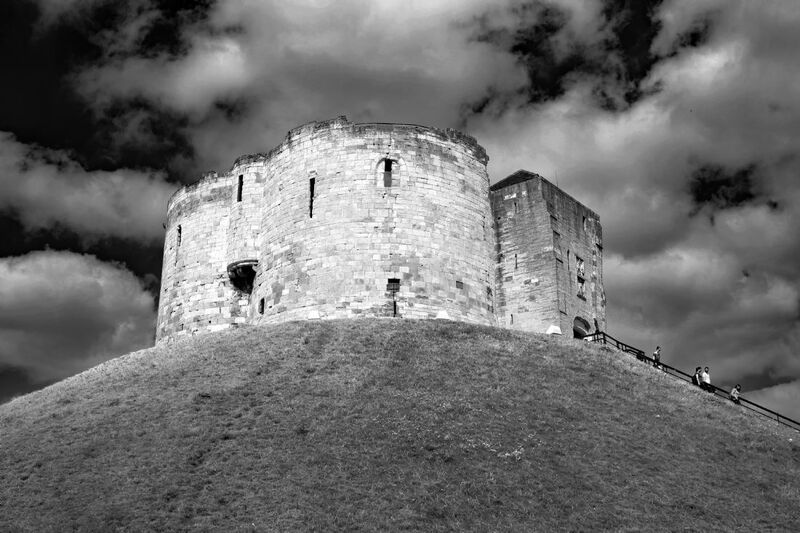 A enhanced picture of Clifford's tower in the City of York. Clifford,s Tower, or York Castle has seen much blood letting over the centuries and now rests on a large earth mound and is one the most popular tourist attractions of York City in the county of Yorkshire. This version has a slight sepia tint. Cliffords tower in black and white. A enhanced picture of Clifford's tower in the City of York. 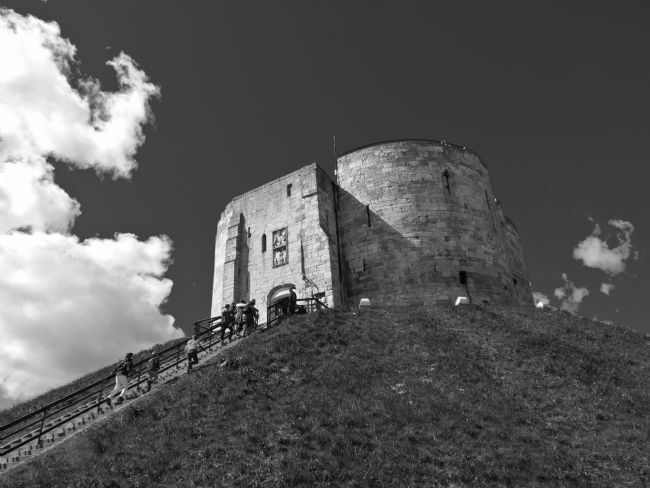 Clifford,s Tower, or York Castle has seen much blood letting over the centuries and now rests on a large earth mound and is one the most popular tourist attractions of York City in the county of Yorkshire. North Eastern Railway Company's memorial. The North Eastern Railway War Memorial is a First World War memorial. It commemorates employees of the North Eastern Railway who left to fight in the First World War and were killed while serving. A monochrome, black and white picture of kings Staith which runs alongside the River Ouse in the City of York in the conty of North Yorkshire, England. A black and white study of Handley-Page Victor K2 Lusty LindyXL231 joined 139 Squadron on 1 February 1962, returning to Handley-Page for conversion to a B(S.R) Mk 2 in November 1963 and joining the Wittering Wing in July 1964. It was converted to become the prototype K.2 Tanker on 23 January 1972 and saw service in the Falklands War, in support of the ‘Operation Black Buck’ Vulcan raid on Port Stanley, and later in the Gulf War. It was flown into retirement at Elvington (Yorkshire Air Museum) in November 1993. The Blackburn Buccaneer, One the first jet aircraft to use boundary layer control to improve slow speed handling and fast low level flight for which it was superb. Used by the Royal Navy the Royal air force and orders were placed with overseas air forces. Buccaneer XX901 had an illustrious service record with the Royal Air Force. In 1983, it took part in the only deployment by Buccaneers to the Falklands and later saw action over Beirut. 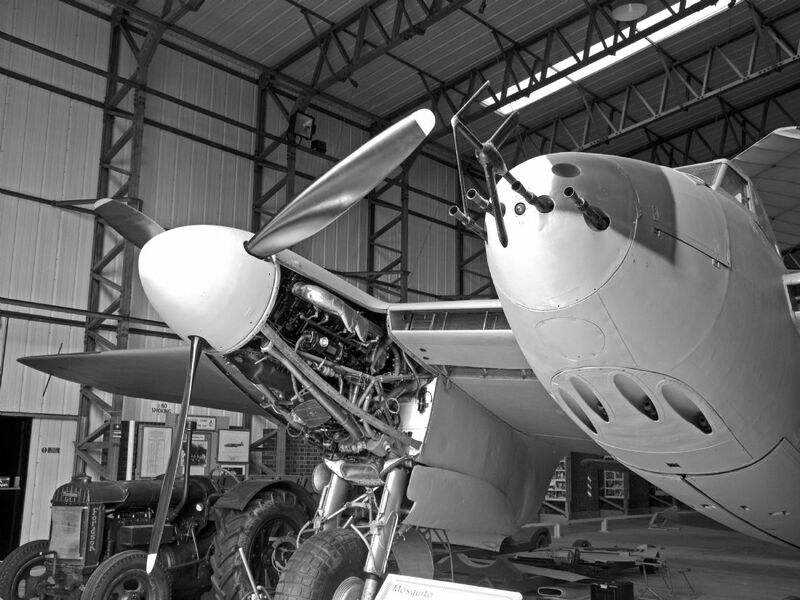 Mosquito in black and white. Waiting...In December 1939, a team under Geoffrey de Havilland, with R E Bishop and C C Walker, started detailed design on a light bomber constructed entirely of wood. The first prototype flew on 25 November 1940. Conceived as an unarmed fast light bomber, the Mosquito was also planned as a photo-reconnaissance aircraft and a night fighter. The second aircraft, flown on 15 May 1941, was the night fighter prototype. A total of 466 Mosquito Night Fighter Mk IIs were produced. Handley-Page Victor K2 Lusty LindyXL231 joined 139 Squadron on 1 February 1962, returning to Handley-Page for conversion to a B(S.R) Mk 2 in November 1963 and joining the Wittering Wing in July 1964. It was converted to become the prototype K.2 Tanker on 23 January 1972 and saw service in the Falklands War, in support of the ‘Operation Black Buck’ Vulcan raid on Port Stanley, and later in the Gulf War. It was flown into retirement at Elvington (Yorkshire Air Museum) in November 1993. A WWII feature icture with aDC3 aircraft in the background, a Mitchell movie camera and rangs finder camera. Featuring a world war two Royal Air Force airfield control tower this picture has three aircraft in the background. 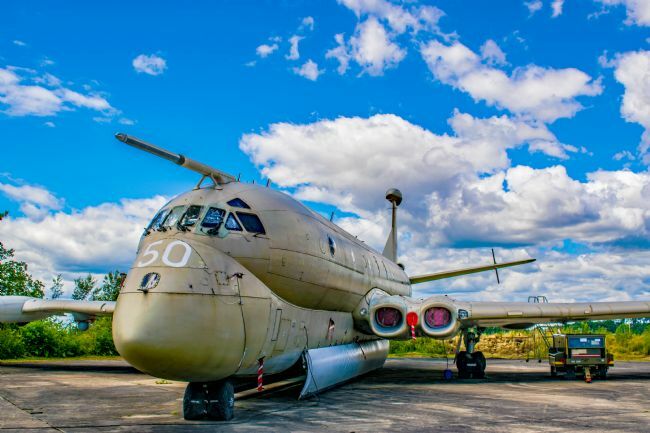 A Nimrod, Gannet and a Victor tanker. 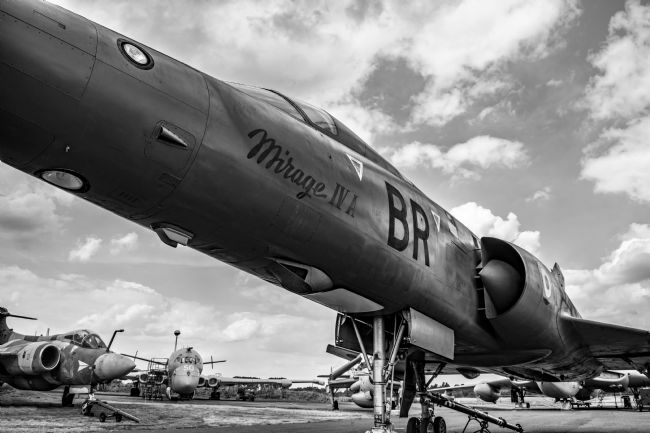 A black and white version of the Mirage is a supersonic strategic bomber and deep reconnaissance aircraft. Capable of Mach 2.2 (1687 mph. It is one of the fastest aircraft in Western Europe. This British Gloster Meteor WK864 Was in service with the Royal Air Force. Powered by two Rolls Royce Dewent 8 turbojets and armed with four 20mm cannon and up to 16 3 inch rockets. It’s first job during WWII was to shoot down V1 flying bombs. This Hunter aircraft represents XL571, the leading aircraft in the record breaking Blue Diamonds formation team of the RAF between 1961 and 1964. This team still holds the record for the largest number of aircraft lopped together. A hunter also held the worlds speed record for awhile with a speed of 727.6 mph, piloted by Neville Duke. A black and white version of the Handley-Page Victor K2 Lusty LindyXL231 joined 139 Squadron on 1 February 1962, returning to Handley-Page for conversion to a B(S.R) Mk 2 in November 1963 and joining the Wittering Wing in July 1964. It was converted to become the prototype K.2 Tanker on 23 January 1972 and saw service in the Falklands War, in support of the ‘Operation Black Buck’ Vulcan raid on Port Stanley, and later in the Gulf War. It was flown into retirement at Elvington (Yorkshire Air Museum) in November 1993. A black and white version of the Royal Air Force aircraft Nimrod MR2 XV250 Maid of Moray now lovingly maintained in running and taxing condition at the Yorkshire Air Museum located at Elvington, in the county of Yorkshire, England. The famous Supermarine Spitfire fighter aircraft. The mighty Merlin Rolls Royce engine is shown with a four bladed propellor. Royal Air Force Victor aircraft XL231 Lusty Lindy from the front. Showing the nose on the aircraft and it’s office windows. York Guildhall was built in 1445 for the Guild of St Christopher and St George and the Corporation, the cost being divided equally between them. The accounts still exist and include a record of 3 pence given to the workmen to celebrate the laying of the foundations. 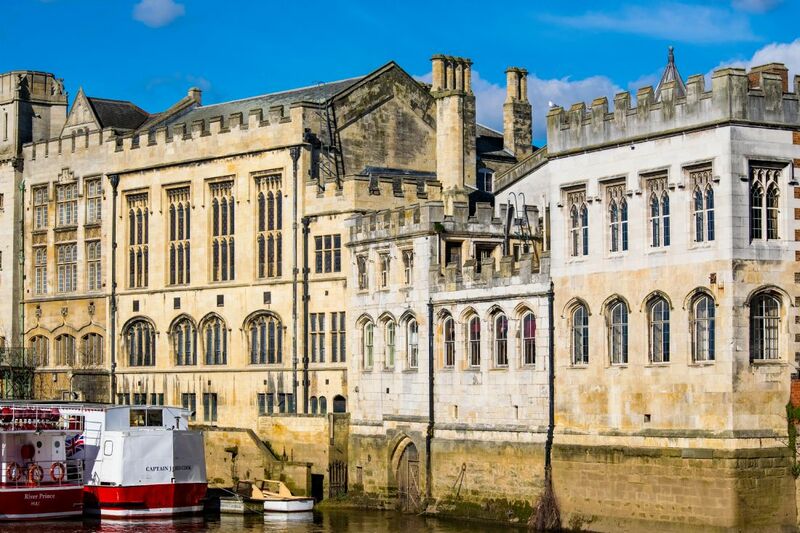 A council meeting is recorded there in May of 1459.Now it still stands in all it,s spender with visitors viewing from a pleasure cruise boat on the River Ouse. A view from the City of York Roman walls across the city to the sun lit Minster. One of the most popular spots in York for a memorable picture. They are known variously as York City Walls, the Bar Walls and the Roman walls. In the distance is Micklegate Bar, one of the four old gated entrances into the city. A lot of the wall is open to the public. A good stroll can be had with views across the city centre on the way round. It has an estimated walk time of about 1 hour with a climb distance of 20 metres. One of the bell towers at the west end of York City minster. The Cathedral and Metropolitical Church of Saint Peter in York, commonly known as York Minster, is the cathedral of York in the county of Yorkshire, England. The two west towers of the minster hold bells, clock chimes and a concert carillon. Part of the famous roman walls around the city of York in North Yorkshire. They are known variously as York City Walls, the Bar Walls and the Roman walls. In the distance is Micklegate Bar, one of the four old gated entrances into the city. York Lendal Bridge, tower and the river Ouse. 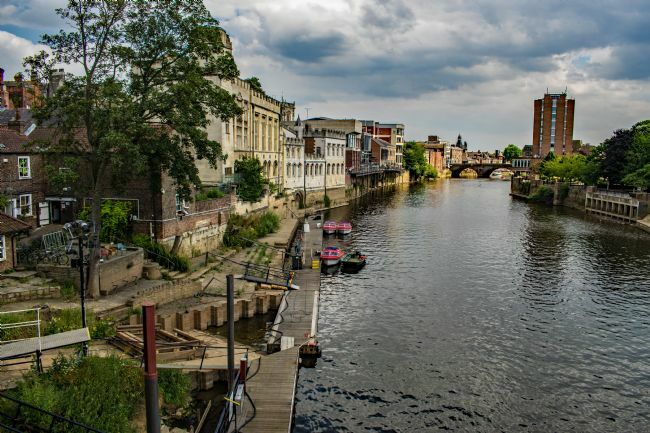 A view across the river Ouse in the City of York in the county of Yorkshire, England. It was 1863 when the bridge opened after the first bridge collapsed during construction, killing five men. A toll was established. The charge was half a penny for foot passengers, a penny for animals and twopence for horse-drawn. Now it is a major crossing over the river Ouse. A modern apartmant building in the City of York in the county of Yorkshire. The Grand Hotel in the city of York North Yorkshire. Built in 1906 as a ‘Palace of Business’ for the North Eastern Railway Company it is now a five star comtemporary hotel. On the right of the picture is the North Eastern Railway War Memorial which is the First World War memorial in York in northern England. 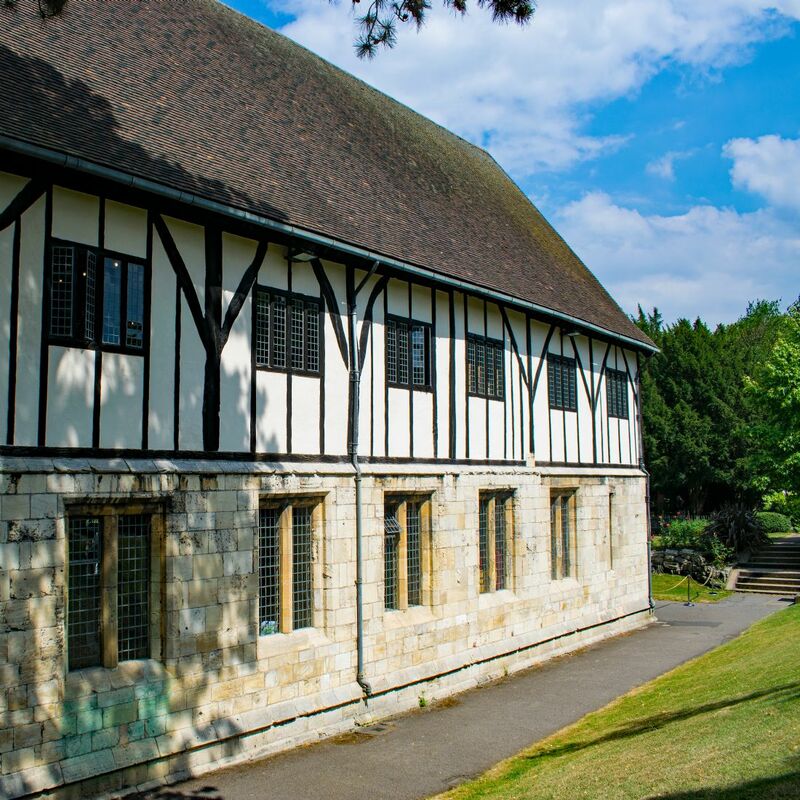 The Hospitium can be found in museum gardens in the City of York, in the county of Yorkshire, England. it was one of the now ruined Sy Marys abby support buildings. The stone ground floor mostly dates to the 1300s with the water gate arch added around 1500. Its not known for sure what it was originally used for, the official listing of the building suggests that it was a place for visitors to stay. This image suitable for round or square coasters only. 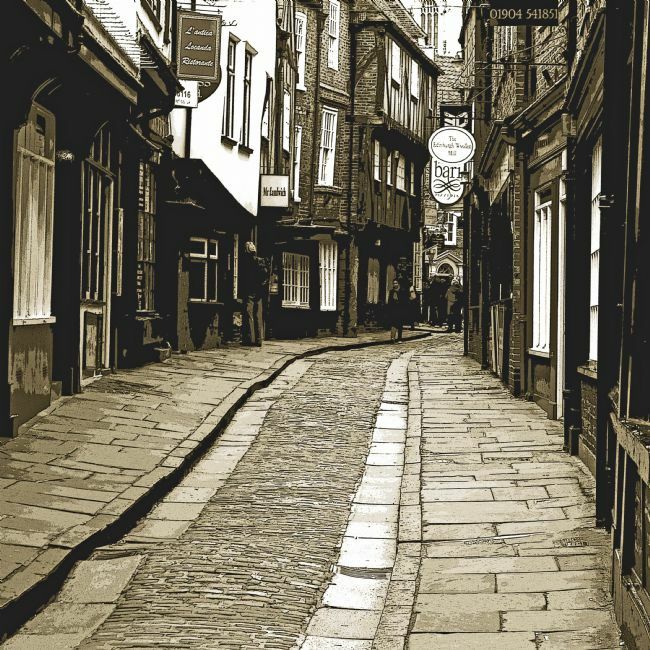 The Shambles is an old street in York, in the county of Yorkshire, England, with overhanging timber-framed buildings, some dating back as far as the fourteenth century. One of the many old timber frame building in the City of York in the county of Yorkshire, England. Ruins of St Mary's Abbey. Part of the ruins of St Marys Abbey, can be found in the Museum gardens in York, Yorkshire. First built in 1088, are all that remains of one of the wealthiest and most powerful Benedictine monasteries in England. One of those must visit locations to visit while in the City. 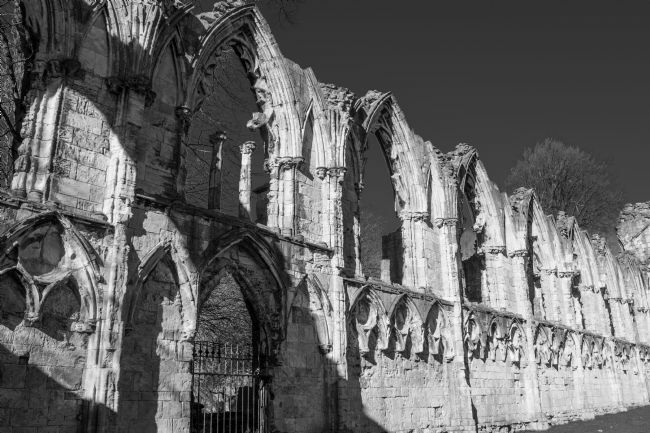 St Mary's abbey in york ruins. The distinctive heart shape tracery atop The Great West Window of York minster can be seen in this picture between the mighty bell towers. Spot the bubbles. 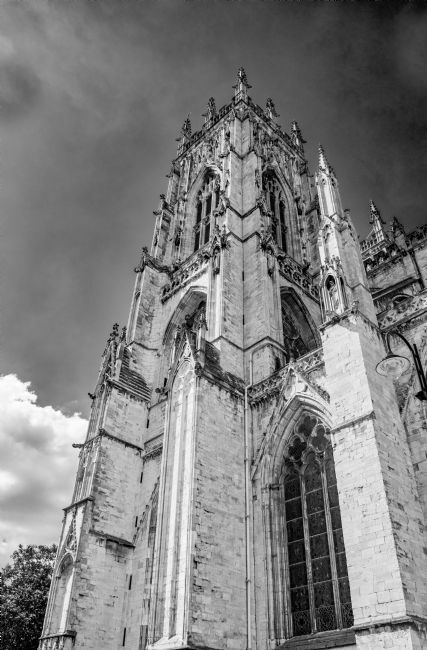 A cityscape view of the mighty York Minster with some soap bubbles near the towers. A view from the City of York Roman walls across the city to the sun lit Minster. 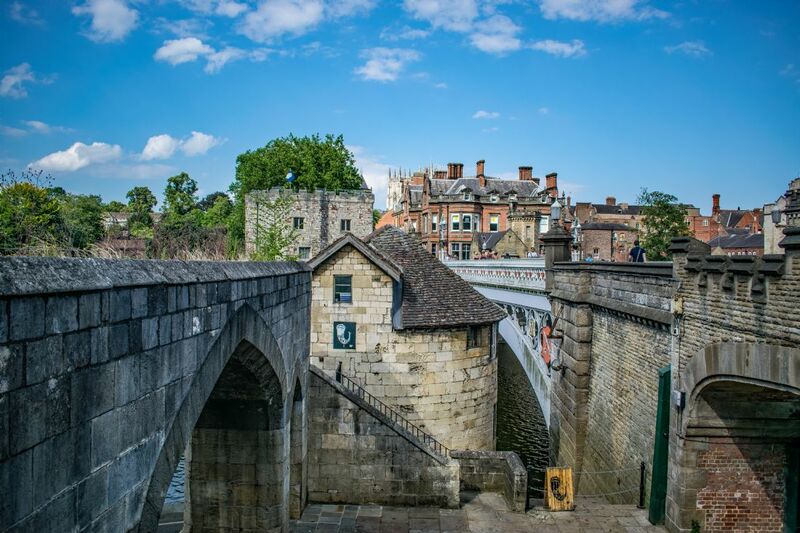 One of the most popular spots in York for a memorable picture. York Guildhall beside the river Ouse. The riverside stone building is in the City of York Guildhall. 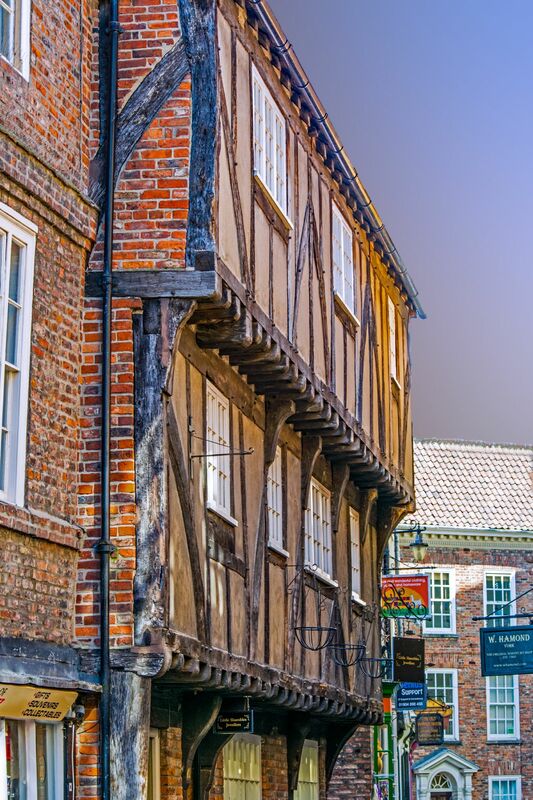 Built in the 15th century and served as a meeting place for the guilds of York. Beside it on the river Ouse are pleasure boats that give tourists to the city trips along the river Ouse. The distinctive heart shape tracery atop the Great West Window of York Minster can be seen in this picture between the mighty bell towers. It is customary for young lovers to kiss under this window. 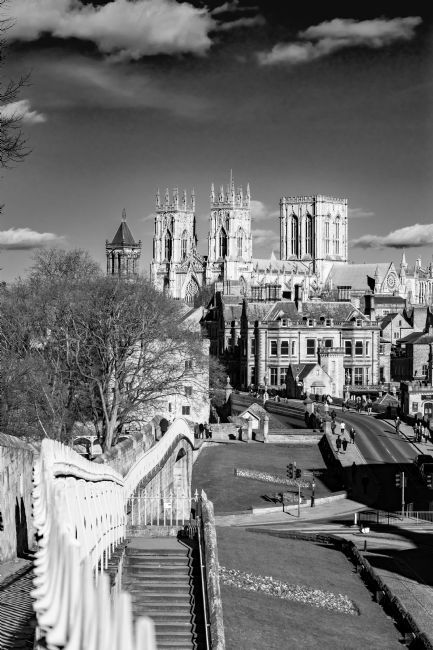 A must see location for your visit to the city of York. York, Bootham bar in colour. Beside the river at Kings Staith in the city of York. A cobbled quay on the north bank of the River Ouse near Ouse Bridge means the King's landing place, the word staith being of Viking origin. An eighteenth century building called Cumberland House overlooks the staith. Just a pair of very artistic street lamps. A summer stroll beside the river Ouse in the City of York, in the county of Yorkshire. 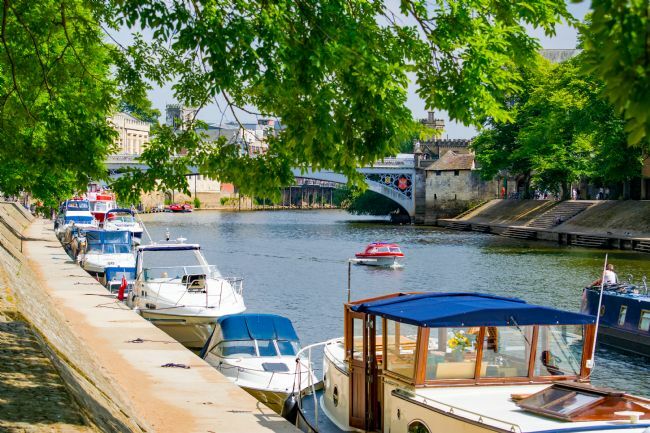 The lendal bridge is seen in the near distance with pleasure craft moored alongside the river bank. Please note that this is a square image and not suitable for all products.The Hospitium can be found in museum gardens in the City of York, in the county of Yorkshire, England. it was one of the now ruined St Marys abby support buildings. The stone ground floor mostly dates to the 1300s with the water gate arch added around 1500. Its not known for sure what it was originally used for, the official listing of the building suggests that it was a place for visitors to stay. This image suitable for round or square coasters only. A square abstract image that started life as a bubble would you believe! York Lendel bridge to Ouse bridge. The river view from Lendal Bridge towards Ouse bridge crossing the river Ouse in the City of York in the county of North Yorkshire. The City of York Bootham Bar was built in the 14th and 19th centuries, it has some of the oldest surviving stonework, dating to the 11th century. One on the ancient gateways into the City. This version is converted to black and white with added Sepia filter. Colour version of the Mirage as a supersonic strategic bomber and deep reconnaissance aircraft. Capable of Mach 2.2 (1687 mph. It is one of the fastest aircraft in Western Europe. Colour version of the Mirage ias a supersonic strategic bomber and deep reconnaissance aircraft. Capable of Mach 2.2 (1687 mph. It is one of the fastest aircraft in Western Europe. 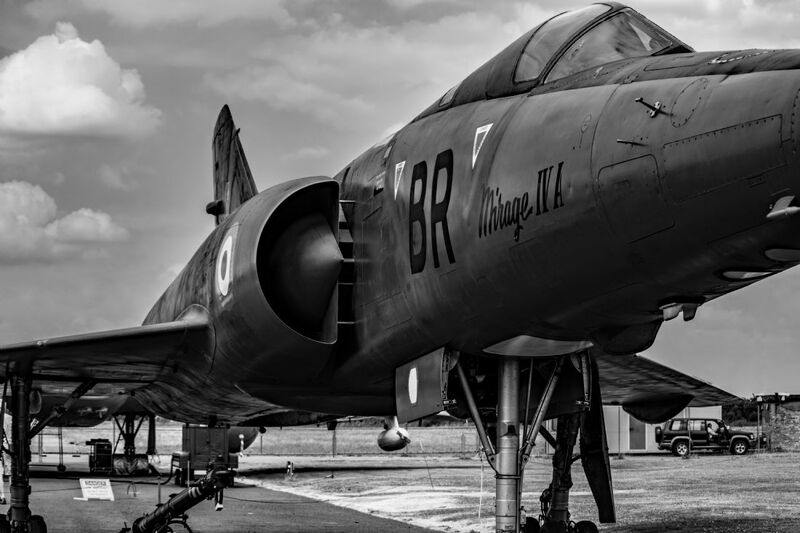 This colour version of the Mirage as a supersonic strategic bomber and deep reconnaissance aircraft. Capable of Mach 2.2 (1687 mph. It is one of the fastest aircraft in Western Europe. This Blackburn Buccaneer aircraft first flew from Holme on Spalding moor in 1966. It was first issued to the Royal Navy at Lossiemouth. It had a busy career before being transferred to the Royal Air Force at RAF Honington. After a long service it now resides at the Yorkshire Air Museum. Abstract picture of a round glass globe. Actually it’s photoshopped from a picture of some moving LED lights. A country road leading through a Yorkshire green valley, with blue skies and fluffy white clouds. Little red boats in miniature. This effect on some types of picture appears to shrink the clear in focus section. This is the little red hire boats on the River Ouse in the city of York, in the county of Yorkshire. A black and white version of the Handley-Page Victor K2 Lusty Lindy XL231 joined 139 Squadron on 1 February 1962, returning to Handley-Page for conversion to a B(S.R) Mk 2 in November 1963 and joining the Wittering Wing in July 1964. 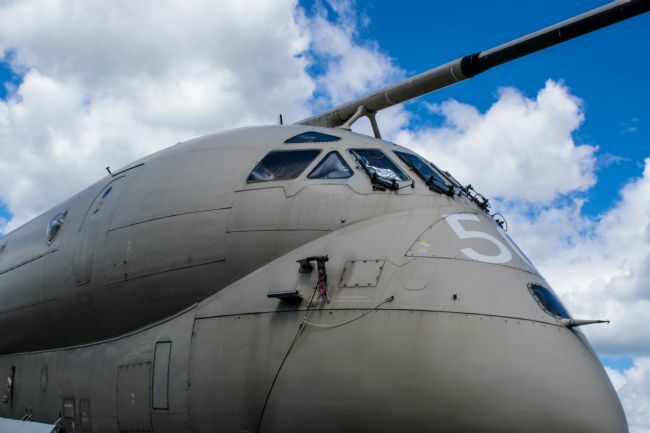 It was converted to become the prototype K.2 Tanker on 23 January 1972 and saw service in the Falklands War, in support of the ‘Operation Black Buck’ Vulcan raid on Port Stanley, and later in the Gulf War. It was flown into retirement at Elvington (Yorkshire Air Museum) in November 1993. 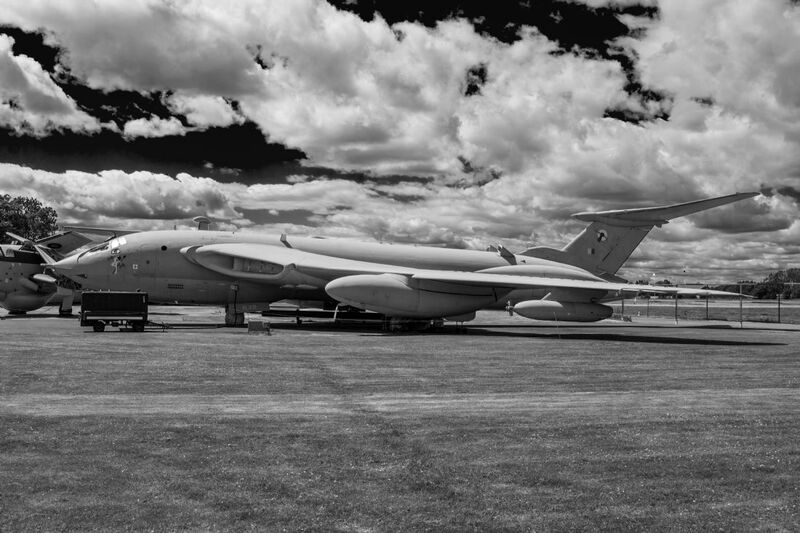 A black and white version of the Royal Air Force aircraft Nimrod MR2 XV250 Maid of Moraynow lovingly maintained in running and taxing condition at the Yorkshire Air Museum located at Elvington, in the county of Yorkshire, England. 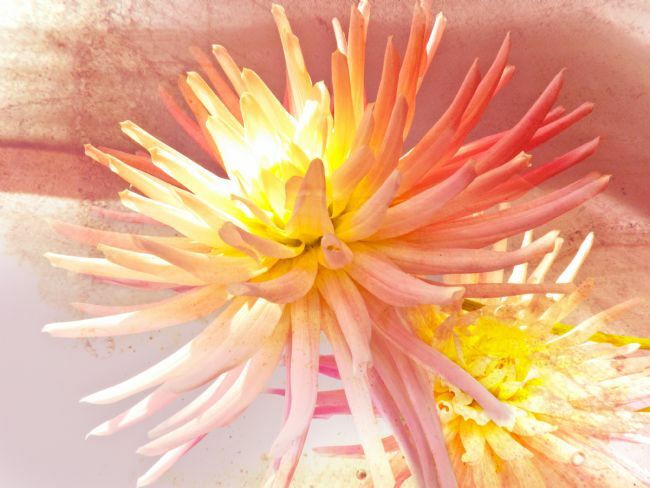 A much enhanced picture of a Anemone flower which now appears inside a glass ball. A colourful abstract picture of curves and shapes on a square format. This stone tower is all that is left of the once large York Castle. Scenes of much blood letting over the centuries, and now stands on its mound and known as Cliffords Tower it is open to the public for viewing with views across the city. An abstract picture that started life as a picture of some autumn headgrow foliage. Now appears to be alive inside a glass globe. An abstract picture that started as a picture of some cherry tree blossom. Now appears trapped inside and glass globe. An abstract picture that started life as a picture of some summer flowers. Now appear to be trapped inside a glass ball. Blue flowers in a pattern on a darker background. This picture processed for round and square coasters. A golden yellow flower trapped inside a glass globe. An abstract picture featuring golden coloured twirls. This is an old street the city of York in the county of North Yorkshire showing some of the various old buildings and roofs in the city. A picture of some Amerthyst crystals patterned with goldan colour added and processed to appear like a globe. Amerthyst is a variety of quartz often used in jewelry. An ammonite fossil imprint. The earliest ammonites appear during the Devonian. Ammonites first appeared in the fossil record 240 million years ago. An abstract picture called twister has many processes to end up as it appears. The City of York Bootham Bar was built in the 14th and 19th centuries, it has some of the oldest surviving stonework, dating to the 11th century and is one of the ancient gateways into the City. Multicoloured moving LED lights reflected and refracted in a crystal ball. A process know as light painting. as light painting. Then a extrude process applied. A beautiful yellow rose in a bunch of flowers. Ex Royal Air Force aircraft Nimrod MR2 XV250 Maid of Moray now lovingly maintained in running and taxing condition at the Yorkshire Air Museum located at Evington, in the county of Yorkshire, England. Handley-Page Victor K2 Lusty Lindy XL231 joined the RAF 139 Squadron on 1 February 1962, returning to Handley-Page for conversion to a B(S.R) Mk 2 in November 1963 and joining the Wittering Wing in July 1964. It was converted to become the prototype K.2 Tanker on 23 January 1972 and saw service in the Falklands War, in support of the ‘Operation Black Buck’ Vulcan raid on Port Stanley, and later in the Gulf War. It was flown into retirement at Elvington (Yorkshire Air Museum) in November 1993. One of the bell towers at the west end of York City minster. The Cathedral and Metropolitical Church of Saint Peter in York, commonly known as York Minster, is the cathedral of York in the county of Yorkshire, England. The two west towers of the minster hold bells, clock chimes and a concert carillon. A must do location on your visit to the city. 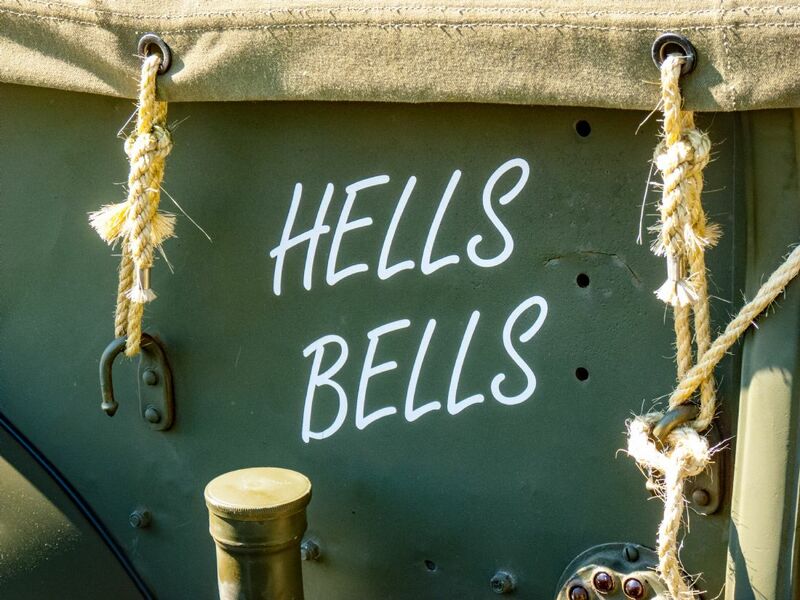 If you are lucky you may hear those wonderful bells peeling out a tune across the city. Once inside the minster you may be lucky to hear the mighty Minster organ being played. That is a real treat for me. Lilium is a genus of herbaceous flowering plants grown from bulbs, all with large prominent flowers. Lilium is a genus of herbaceous flowering plants grown from bulbs, all with large prominent flowers. This picture processed for printing on coasters. A red flower in full summer bloom on a textured background. Part of the famous roman walls around the city of York in North Yorkshire.They are known variously as York City Walls, the Bar Walls and the Roman walls. In the distance is Micklegate Bar, one of the four old gated entrances into the city. A lot of the wall is open to the public. A good stroll can be had with views across the city centre on the way round. It has an estimated walk time of about 1 hour with a climb distance of 20 metres. The Grand hotel of York, Yorkshire. The Grand Hotel in the city of York North Yorkshire. Built in 1906 as a ‘Palace of Business’ for the North Eastern Railway Company. it is now a five star contemporary hotel. 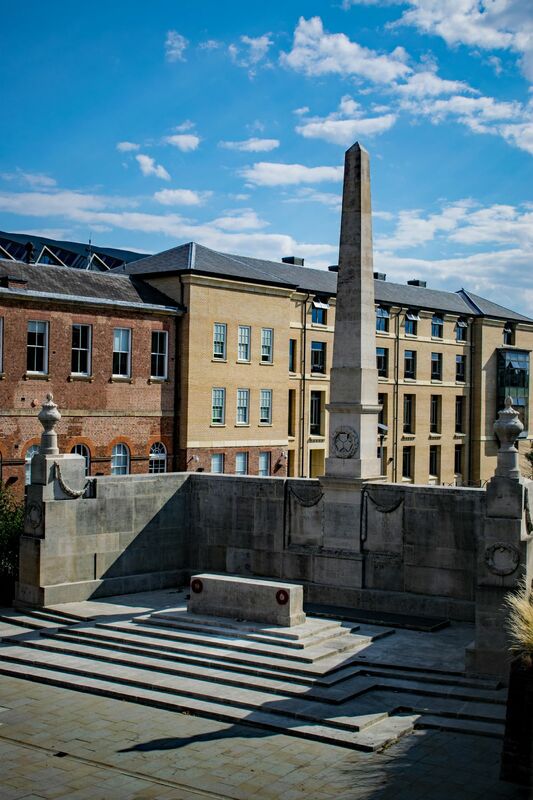 On the right of the picture is the North Eastern Railway War Memorial which is the First World War memorial in York in northern England. A spitfire aircraft of WWII with an ovelay wood texture. This picture processed for printing on round and square coasters. 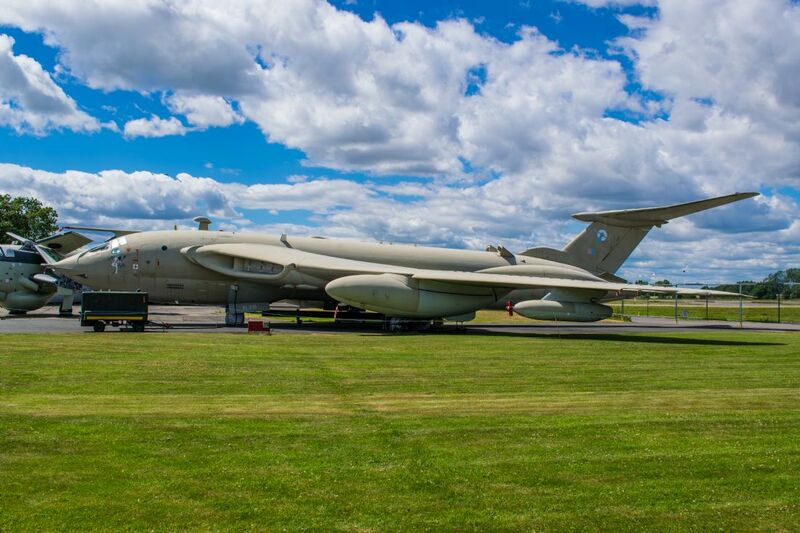 Handley-Page Victor K2 Lusty Lindy XL231 joined 139 Squadron on 1 February 1962, returning to Handley-Page for conversion to a B(S.R) Mk 2 in November 1963 and joining the Wittering Wing in July 1964. It was converted to become the prototype K.2 Tanker on 23 January 1972 and saw service in the Falklands War, in support of the ‘Operation Black Buck’ Vulcan raid on Port Stanley, and later in the Gulf War. It was flown into retirement at Elvington (Yorkshire Air Museum) in November 1993. This picture processed for printing on coasters. 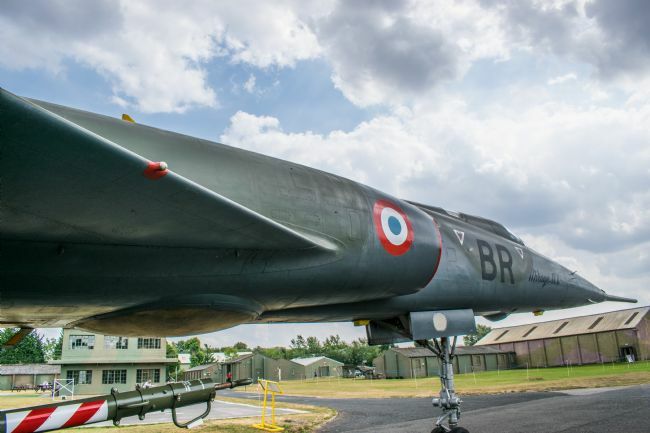 This Hunter jet aircraft represents XL571, the leading aircraft in the record breaking Blue Diamonds formation team of the RAF between 1961 and 1964. This team still holds the record for the largest number of aircraft lopped together. A hunter also held the worlds speed record for awhile with a speed of 727.6 mph, piloted by Neville Duke. This picture processed for printing on coasters. A picture of some Amethyst crystals patterned with golden colour added. A variety of quartz often used in jewellery. A pop art picture with blue, red,green, and yellow abstract columns. Blooms of a dark pink Rhododendron. A species of woody plants in the heath family. Blooms of a dark pink Rhododendron. A species of woody plants in the heath family. This is processed for printing on coasters. A single Xerochrysum bracteatum, commonly known as the golden everlasting or strawflower, flower with an added texture background. Xerochrysumis also known as the everlasting flower or straw flower, as it is a dry flower and last a long time on display. Featuring a world war two Royal Air Force airfield control tower this picture has three aircraft in the background. 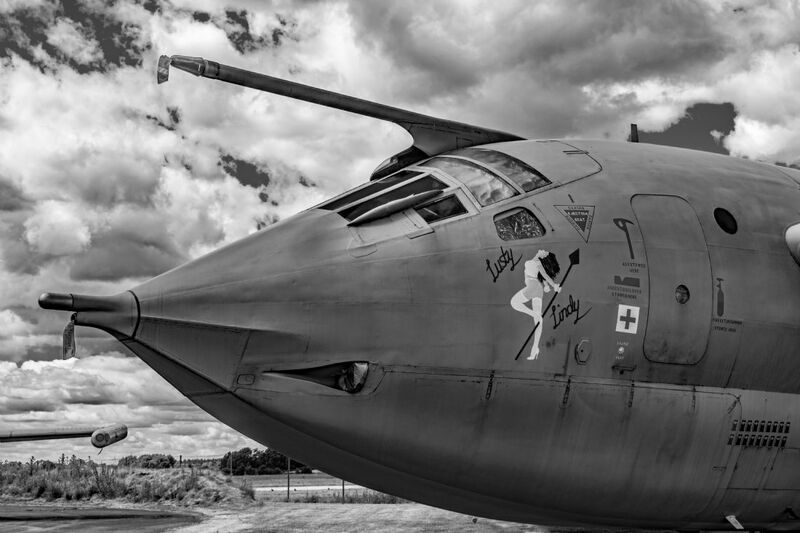 A Nimrod, Gannet and a Victor tanker. This picture processed for printing on square coasters. Now a museum exhibit this control tower is presented how it was during the second world war. Waiting...In December 1939, a team under Geoffrey de Havilland, with R E Bishop and C C Walker, started detailed design on a light bomber constructed entirely of wood. The first prototype flew on 25 November 1940. Conceived as an unarmed fast light bomber, the Mosquito was also planned as a photo-reconnaissance aircraft and a night fighter. The second aircraft, flown on 15 May 1941, was the night fighter prototype. A total of 466 Mosquito Night Fighter Mk IIs were produced. This picture processed for square coasters. A pink and yellow dahlia flower bloom lit by the rays of the sun. This picture is with added texture. This picture is processed for printing on round and square coasters. A single pink Dahlia flower bloom with some added background plants above some water. This picture processed for printing on round and square coasters. A single pink dahlia flower in full bloom against a black backgound. This picture processed for printing on round or square coasters. Brighly coloured red / yellow flowers are given the ‘plastic wrap ‘ process. This picture processed for printing on round and square coasters. Dahlia pom pom flower Coasters. Dahlia pom pom flower. A single red bloom. A member of the Asteraceae, dicotyledonous plants, This picture processed for printing on round and square coasters. Reaching for the sky is a Foxglove (Digitalis purpurea) presented on a textured background. This picture processed for printing on round and square coasters. A single pink bloominmg English rose with water drops. This picture processed for printing on round and square coasters. A single red poppy in full bloom in bright sunlight. This picture is processed for printing on round and square coasters. A single wet red rose from an English country garden. This picture is processed for printing on round and square coasters. A single blooming wet red rose with an added texture overlay. This image is processed for printing on round and square coasters. A rowan tree with it’s red berries on the textured sky background. This picture processed for printing on round and square coasters. A Rowan tree and it’s berries on a textured wood background. This picture is processed for printing on round and square coasters. This is the River Ouse riverside in the City of York in the county of Yorkshire. A popular spot to take a stroll by the river under the shade of the trees and admire the artists work on display during the summer market days. The centre section of the Chapter house roof in York Minster. It begun in about 1260. example of the Gothic Decorated style which was then in vogue. Abstract picture representing a power cell. A round subject in a square frame. A abstract image. Flower full is a represention of a glas globe full with brightly coloured flowers. This picture processed for round ans square coasters. An abstract square picture representing a colourful glass globe. This picture processed for printing onto round and square coasters. A photoshop processed picture which shows many coloured globes within globes. This version is with a red background. This picture processed for printing on round and square coasters. A enhanced abstract picture titled power cell. A textures backgrounf has been added. This picture processed for printing on round and square coasters. a close up picture of a slice of the mineral agate. false colour is added to enhance the grain. This picture processed for printing on round and square coasters. Agate dreans in green Coasters. Agate dreams in yellow Coasters. Multicoloured moving LED lights reflected and refracted in a crystal ball. A process know as light painting. as light painting. This picture processed for printing on round and square coasters. A picture of some Amethyst crystals patterned with blue colour added. A variety of quartz often used in jewellery. Multicoloured moving LED lights during a long exposure. A process know as light painting. This picture processed for printing onto round and square coasters. Moving multicoloured LED lights reflected in a glass crystal ball. A method known as light painting. 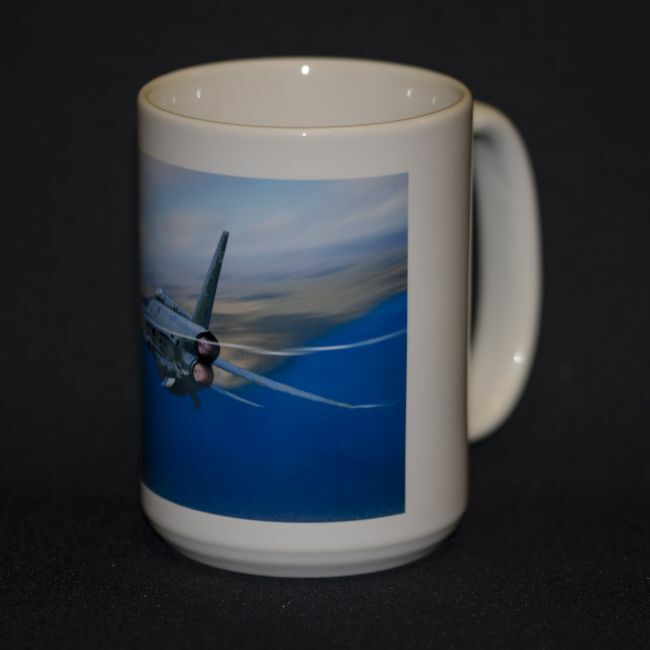 This picture processed for printing on round and square coasters Also good for other products in square format. Moving multicoloured LED lights A method known as light painting. Now with added motion blur. This picture is processed for printing on round and square coasters. Moving multicoloured LED lights A method known as light painting. Now with added motion blur. This picture processed for printing on round and square coasters. An abstract picture of a painters palette with some added texture. This picture processed to print on round and square coasters. Originally a picture long exposure of moving LED lights which now looks like abstract feather. This picture processed for printing on round and square coasters. Moving multicoloured LED lights reflected in a glass crystal ball. A method known as light painting. With added Photoshop Fresco effect. This picture is processed for printing on round and square coasters. An enhanced abstract picture the appears to be liquid in motion. This picture is processed for printing on round and square coasters. A digital abstract sunset with many bright rainbow colours. This picture processed for printing on round and square coasters. Multicoloured moving LED lights reflected and refracted in a crystal ball. A process know as light painting. This picture has been proccessed for printing on round and square coasters. Multicoloured moving LED lights reflected and refracted in a crystal ball. A process know as light painting. This picture has been processed for printing on round and square coasters. Moving multicoloured LED lights reflected in a glass crystal ball. A method known as light painting. This picture is processed for printing on round and square coasters. An abstract brightly coloured square picture. In yellow, red, orange and blue. This picture has been processed for printing on round and square coasters. Multicoloured moving LED lights reflected and refracted in a crystal ball. A process know as light painting. This picture has been processed for printing on round ans square coasters. Rolling orb in abstract Coasters. A section of the city of York famous Roman walls presented here as an out of frame picture. Featuring part of the stone defense wall entering the frame section of the picture. 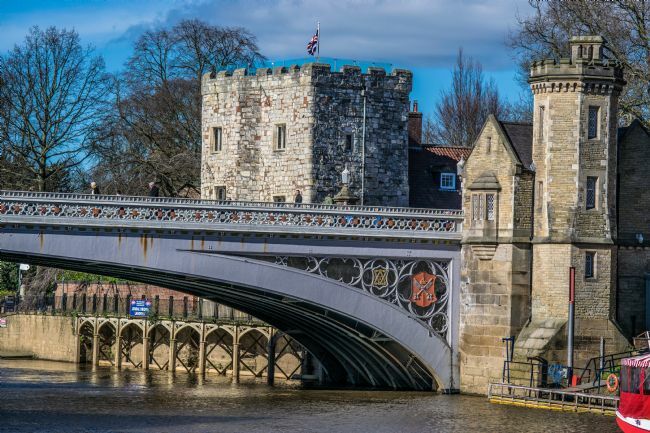 The famous roman walls around the city of York in North Yorkshire.They are known variously as York City Walls, the Bar Walls and the Roman walls. In the distance is Micklegate Bar, one of the four old gated entrances into the city. A lot of the wall is open to the public. A good stroll can be had with views across the city centre on the way round. It has an estimated walk time of about 1 hour with a climb distance of 20 metres. 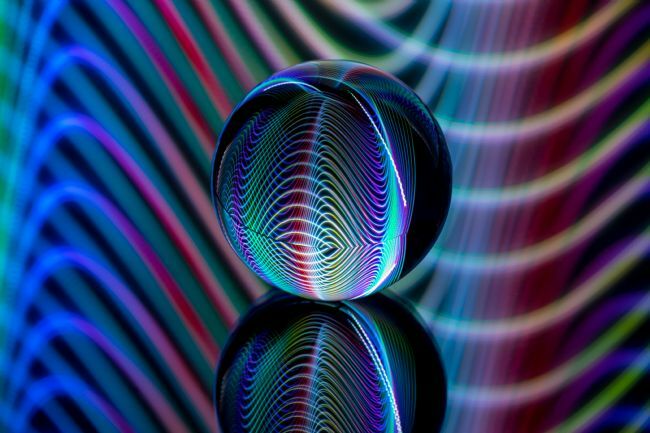 Light waves in the crystal ball. A male Blackbird of the species (Turdus merula) can be found in many countries. This one is at home in out English garden. 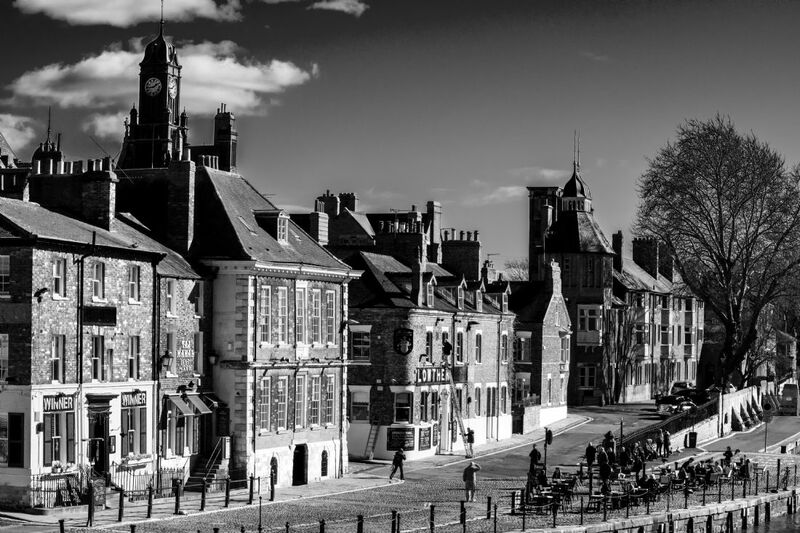 The view across exhibition square in the city of York in the county of Yorkshire, England. A sepia tinted picture. The world famous York Minster is one of Europe's largest gothic cathedrals. Spot the bubbles. A cityscape view of the mighty York Minster with some soap bubbles near the towers. Just one of the fun things that happen in the city during the summer. A large American forces army truck. A large British army truck (troop carrier) When I find more details of this vehicle I shall amend. 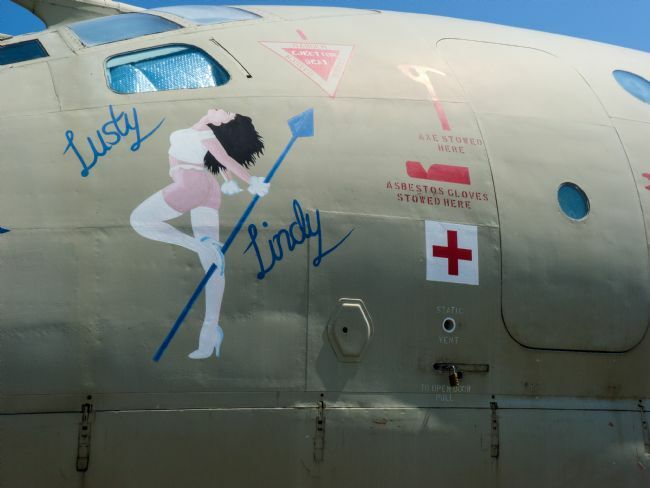 The tradition of nose art on aircraft is shown here. It is Lusty Lindy. 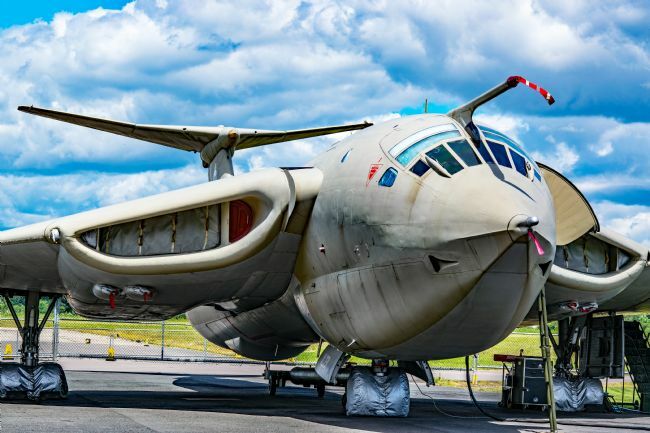 Handley-Page Victor K2 Lusty LindyXL231 joined 139 Squadron on 1 February 1962, returning to Handley-Page for conversion to a B(S.R) Mk 2 in November 1963 and joining the Wittering Wing in July 1964. It was converted to become the prototype K.2 Tanker on 23 January 1972 and saw service in the Falklands War, in support of the 'Operation Black Buck' Vulcan raid on Port Stanley, and later in the Gulf War. It was flown into retirement at Elvington (Yorkshire Air Museum) in November 1993. A bright red flower known as an everlasting flower is captured in a out of frame picture. The view from a part of the Roman walls in the City of York. Looking towards the great Minster church in the background. 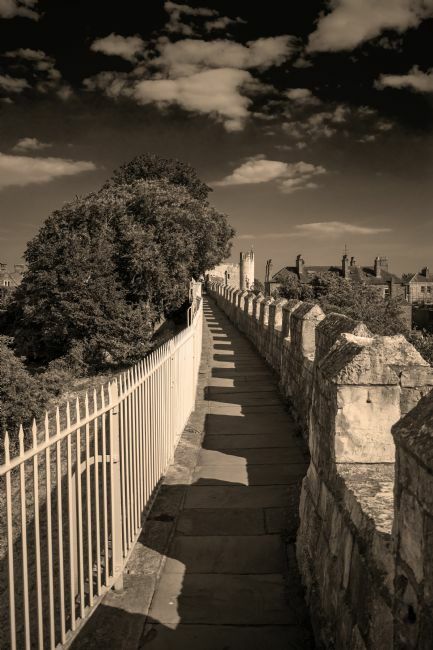 The railings you see to the bottom left are part of the Roman wall and forms part of a walk that will take about one hour and circle the city and visiting the bars on it's travels around the back of the Minster with a climb of about twenty metres. Moving multicoloured LED lights A method known as light painting. Now with added motion blur. 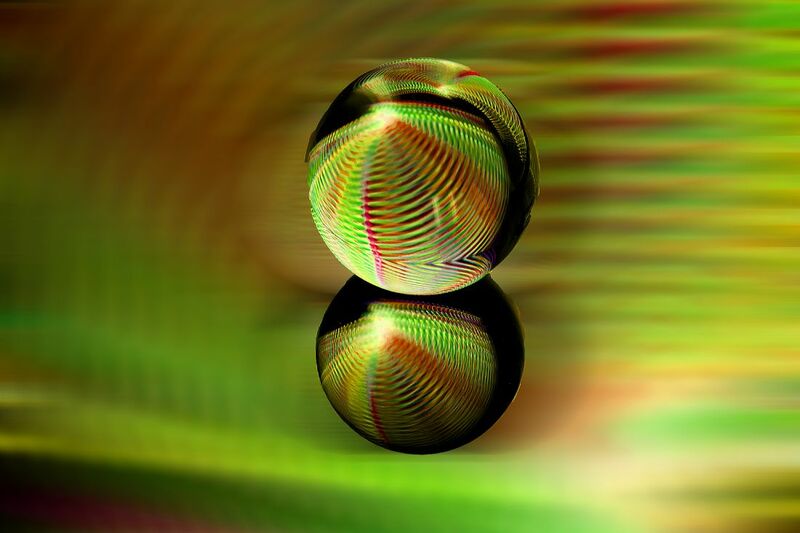 Multicoloured moving LED lights reflected and refracted in a crystall gall ball. Known as light painting. Criss Cross lights in crystal ball. Multicoloured moving LED lights reflected and refracted in a crystal ball. Known as light painting. Originally a picture long exposure of moving LED lights which now looks like abstract feather. An abstract picture processed using photoshop for bright colours and pattern. An abstract picture originating from a painters pallete Many spots and lines of colours. Gloster Meteor F8 Jet aircraft. This British Gloster Meteor WK864 Was in service with the Royal Air Force. Powered by two Rolls Royce Dewent 8 turbojets and armed with four 20mm cannon and up to 16 3 inch rockets. It's first job during WWII was to shoot down V1 flying bombs. 'The Office' of RAF aircraft Nimrod MR2 XV250 Maid of Moray now lovingly maintained in running and taxing condition at the Yorkshire Air Museum located at Elvington, in the county of Yorkshire, England. A douglas DC3 world war two aircraft on display in a aircraft museum. It is reckoned that each DC3 used 500,000 rivets in it's construction! Hence the title. Rivets. A Supermarine spitfire picture with some digital enhancments. Brightly coloured red / yellow flowers are given the 'plastic wrap' process. A crocus flower in bloom on a snowy spring day. English red and white climbing roses in an English garden. A rowan tree with it's red berries on the textured sky background. A Rowan tree and it's berries on a textured wood background. A supermarine Spitfire aircraft shown as a pop art image with blue, red,green and yellow sections. Multicoloured moving LED lights reflected and refracted in a crystal ball. A process know as light painting. With added photshop frosted effect. An abstract brightly coloured square picture. In yellow, red, orange and blue. An abstract square picture representing a colourful glass globe. A single wet red rose from an English country garden. A single blooming wet red rose with an added texture overlay. 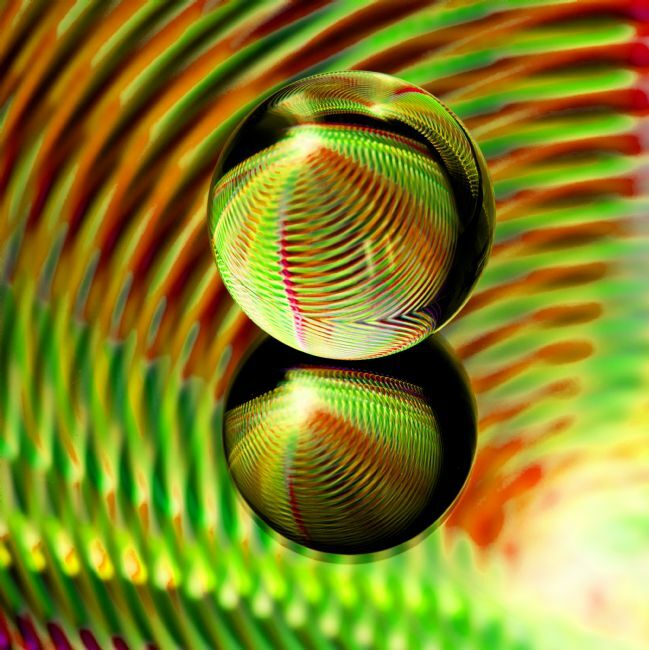 An enhanced abstract picture the appears to be liquid in motion. An abstract picture of liquid in a spiral in a square format. Abstract picture called spiral fire. A square picture. The flag of the United States of America on show amongst some vintage military vehicles. A Supermarine Spitfire aircraft of WWII with an overlay wood texture. Spitfire is a British single-seat fighter aircraft used by the Royal Air Force and other Allied countries before, during and after World War II. A black and white picture of a Yorkshire valley. Converted to a IR effect. 'Supacat' is a versatile, lightweight load-carrying vehicle used by airborne and air-mobile battalions of the British Army. Amphibious, with a very low ground pressure, the ATMP's six wheels allow it to cross rough terrain and water obstacles. It can be fitted out with a variety of different load pallets and guns. This version has added Depth of Field to enhance the vehicle. A quite, restful corner of a English churchyard. With cherry blossom and flowers. An out of bounds picture featuring the famous York city Medieval wall leading into a frame with the famous York City Minster church in the background. Part of the famous roman walls around the city of York in North Yorkshire.They are known variously as York City Walls, the Bar Walls and the Roman walls. In the distance is Micklegate Bar, one of the four old gated entrances into the city. A lot of the wall is open to the public. A good stroll can be had with views across the city centre on the way round. It has an estimated walk time of about 1 hour with a climb distance of 20 metres. A enhanced abstract picture titled power cell. A textures backgrounf has been added. An abstract picture featuring rainbow colours on a mosaic pattern. An abstract round subject in a square format. Could be mistaken for an eye. A abstract image. Flower full is a represention of a glas globe full with brightly coloured flowers. Believe it or not this picture is of several peaches. A bit of work and I have produced this abstract extruded picture. A close up picture of a slice of the mineral agate. false colour is added to enhance the grain. A photoshop processed picture which shows many coloured globes within globes. This version is with a red background. A photoshop processed picture which shows many coloured globes within globes. A single red poppy in full bloom on a sunny day. A photoshop enhanced abstract picture of some purple flowers which now appear trapped in a glass globe. A photoshoped abstract picture which started as a flower, now with added mosaic affect. An abstract picture enhanced by photoshop. Rainbow colours forming colourful arches. A WWII feature picture with a DC3 Dakota aircraft in the background, a Mitchell movie camera and range finder camera. Buccaneer XX901 had an illustrious service record with the Royal Air Force. In 1983, it took part in the only deployment by Buccaneers to the Falklands and later saw action over Beirut. Nose art on the aircraft is titled The flying mermaid. A Douglas dc3 Aircraft twin piston engined aircraft starting engines ready for a display. A single pink single flowering Calla lilly. A Dog Rose.Rosa canina. A typical plant to found is many English hedgerows. Multicoloured moving LED lights reflected and refracted in a crystal ball. A process know as light painting. as light painting. Multicoloured moving LED lights reflected and refracted in a glass ball. With added photoshop process. Multicoloured moving LED lights during a long exposure. A process know as light painting. A digital abstract sunset with many bright rainbow colours. A simple abstract shot of rain running down a glass window although much enhanced with photoshop. Rainbows in the glass ball. Reflections in the crystal ball. Mosquito aicraft in black and white. In December 1939 a team under Geoffrey de Havilland, with R E Bishop and C C Walker, started detailed design on a light bomber constructed entirely of wood. The first prototype flew on 25 November 1940. Conceived as an unarmed fast light bomber, the Mosquito was also planned as a photo-reconnaissance aircraft and a night fighter. The second aircraft, flown on 15 May 1941, was the night fighter prototype. A total of 466 Mosquito Night Fighter Mk IIs were produced. Handley-Page Victor K2 Lusty LindyXL231 joined 139 Squadron on 1 February 1962, returning to Handley-Page for conversion to a B(S.R) Mk 2 in November 1963 and joining the Wittering Wing in July 1964. It was converted to become the prototype K.2 Tanker on 23 January 1972 and saw service in the Falklands War, in support of the 'Operation Black Buck' Vulcan raid on Port Stanley, and later in the Gulf War. It was flown into retirement at Elvington (Yorkshire Air Museum) in November 1993. 'The Office' of RAF aircraft Nimrod MR2 XV250 Maid of Moraynow lovingly maintained in running and taxing condition at the Yorkshire Air Museum located at Elvington, in the county of Yorkshire, England. 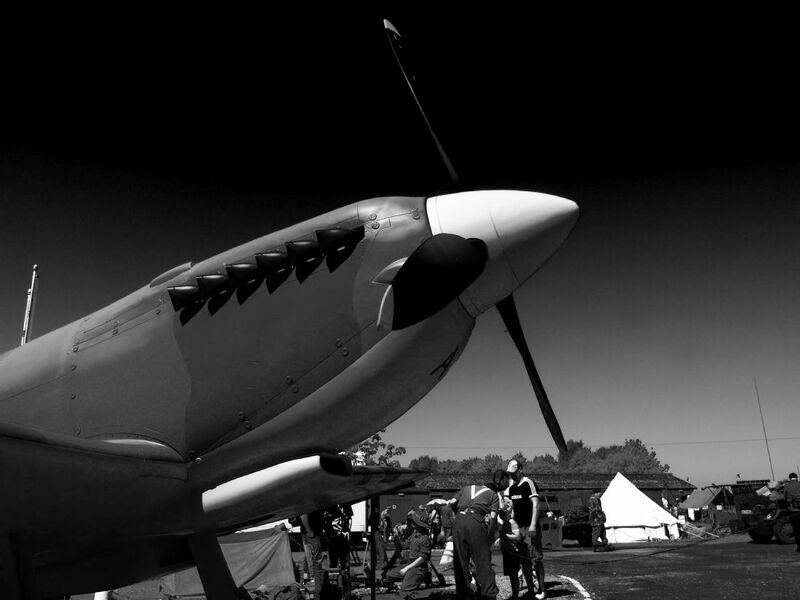 A static display Supermarine Spitfire aircraft. Nose art on a Handley Page Halifax bomber aircraft MkII (III) A black and white study of a famous world war 2 aircraft at the Yorkshire Air Museum.The Museum's Halifax reconstruction is based on a section of the fuselage of Halifax II, HR792, which carried out an emergency landing on the Isle of Lewis in 1945. A crofter, Mr McKenzie, purchased the fuselage section for use as a hencoop. The wings came from Hastings, TG536, at RAF Catterick. Bootham bar. One of the four gateways into the medieval city of York in the county of Yorkshire, England. The archway dates back to the 11th century with many changes to its use and structure over the centuries. A black and white picture. A view across the rooftops towards the church of All Saints in the town of Helmsley in the county of North Yorkshire. A black and white version of a scene at Helmsley, North Yorkshire. By the river at Kings Staith in the city of York. Converted to B & W. Plus sepia and red. A cobbled quay on the north bank of the River Ouse near Ouse Bridge means the King's landing place, the word staith being of Viking origin. An eighteenth century building called Cumberland House overlooks the staith. The River Ouse in York. A river view from Lendal bridge crossing the river Ouse in the city of York inthe county of Yorkshire, England. On the left is Kings Staith. A single pink Dahlia flower bloom with some added background plants above some water. Dahlia is a bushy, tuberous, herbaceous perennial plant native to Mexico. Foxglove flowers (Digitalis purpurea) growing to the sky with a textured background. 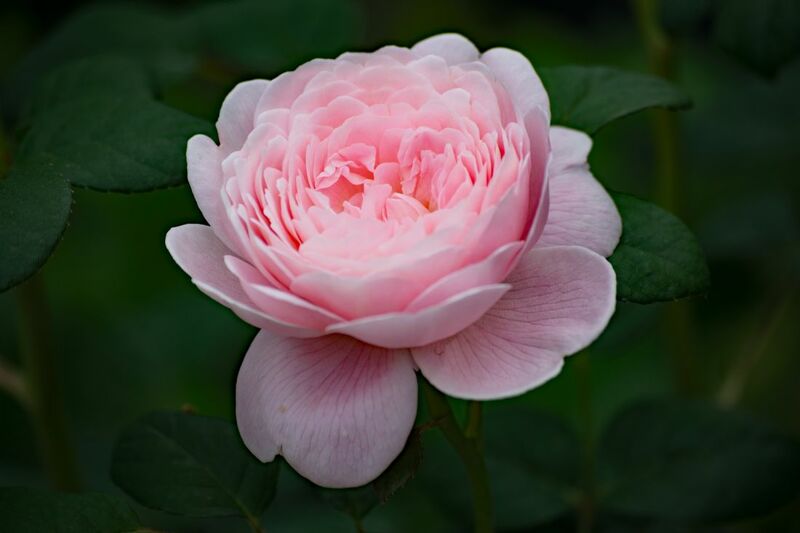 A single pink blooming English rose with water drops on it's petals. Rose is a woody perennial flowering plant of the genus Rosa. A single red poppy in full bloom in bright sunlight. A multi exposure of several brightly coloured flowers merged into one brightly coloured floral picture. Bright red rosehip berries in an out of bounds frame. A single pink dahlia flower in full bloom against a black background. A single pink Dhalia flower bloom in the bright sunshine against a textured background. Reaching for the sky is a Foxglove (Digitalis purpurea) presented on a textured background. A river view from Lendal bridge crossing the river Ouse in the city of York in the county of Yorkshire, England. On the left is Kings Staith. A cobbled quay on the north bank of the River Ouse near Ouse Bridge means the King's landing place, the word staith being of Viking origin. An eighteenth century building called Cumberland House overlooks the staith. 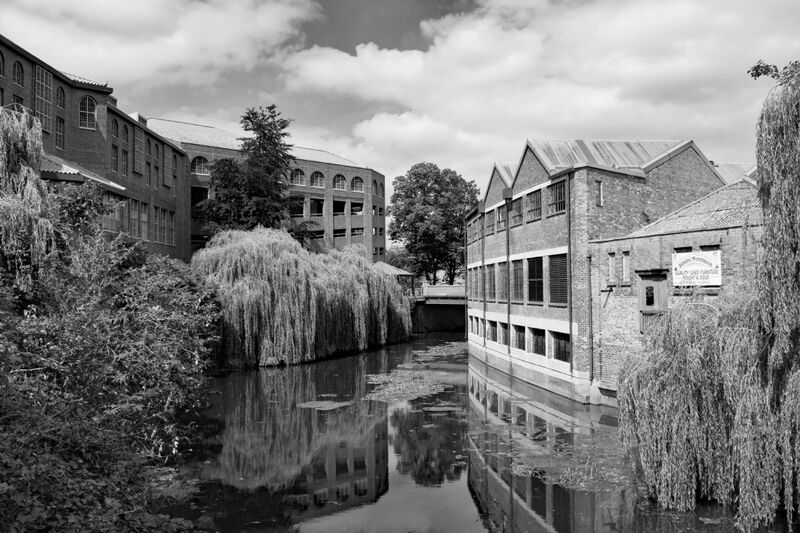 A monochrome, or black and white picture of kings Staith which runs alongside the River Ouse in the City of York in the county of Yorkshire. A cobbled quay on the north bank of the River Ouse near Ouse Bridge means the King's landing place, the word staith being of Viking origin. An eighteenth century building called Cumberland House overlooks the staith. 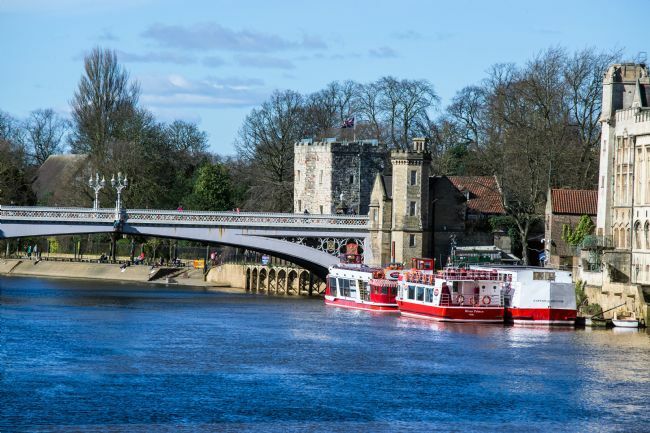 Yorks small red boats taking a rest on the river Ouse alongside the York city Guildhall in the county of North Yorkshire. The Guildhall can be see on the left riverbank. 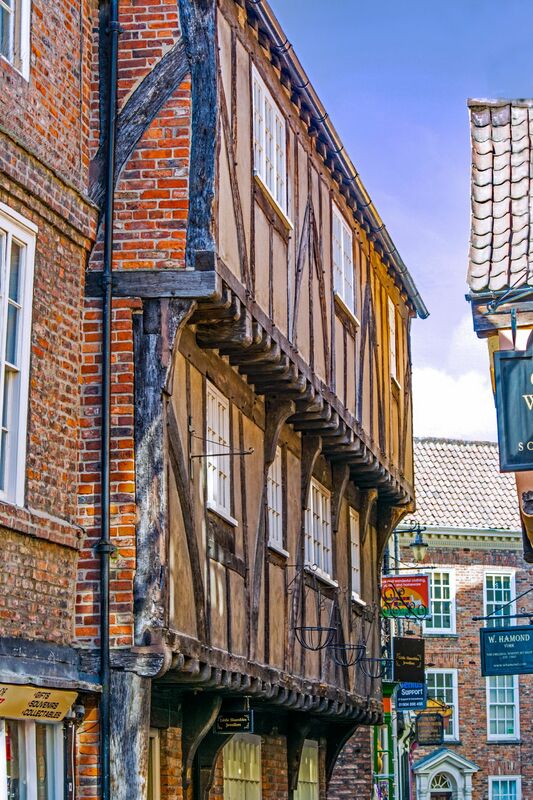 One the oldest of York cities authoritative buildings. With added texture this is Lendal Tower and Lendal bridge in the City of York in the county of North Yorkshire. A pleasure cruiser is seen on the River Ouse. Yorkshire Museum located in Museum gardens in the City of York. Red hire boats floating ready for hire on the river Ouse in York in the county of Yorkshire, England. A black and white out of fromae picture of buildings on the side of the river Ouse in the City of York, in the county of North Yorkshire England. 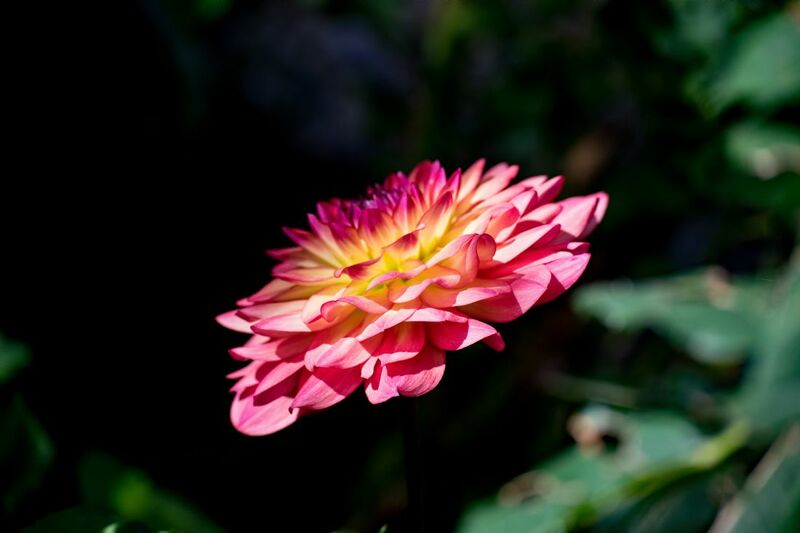 A pink and yellow dahlia flower bloom lit by the rays of the sun. This picture is with added texture. 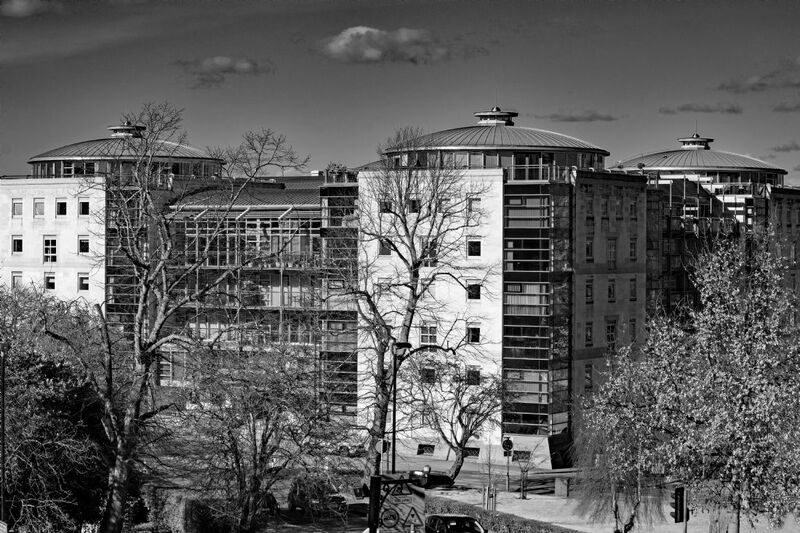 An out of bounds picture of a modern office building in the city of York, Yorkshire, in the county of North Yorkshire, England. Rainbows 2 in the glass ball. This Hunter represents XL571, the leading aircraft in the record breaking Blue Diamonds formation team of the RAF between 1961 and 1964. This team still holds the record for the largest number of aircraft looped together. A hunter also held the worlds speed record for awhile with a speed of 727.6 mph, piloted by Neville Duke. Moving multicoloured LED lights. A method known as light painting. Multicoloured moving LED lights reflected and refracted in a crystal ball. A process know as light painting. It involves long exposures and moving brightly coloured LED lights. Moving multicoloured LED lights reflected in a glass crystal ball. A method known as light painting. With added Photoshop Fresco effect.